Although the Aeolian Islands are not particularly well-known to English-speaking tourists, they are wonderful places to spend a relaxed week or fortnight. In July and August Italian holiday-makers descend en-masse on these 'pearls of the Mediterranean'. But in May, June or September, you should enjoy fine weather and glorious views without the crowds. On my first visit I booked for four nights, and loved it so much on Lipari that I changed my flight to allow for more time and more boat trips to other islands. I wrote the notes for this page sitting by the little harbour in Lipari town with a glass of the sweet local wine Malvasia - served with biscotti - while the evening sunlight illuminated the little chapel beyond the fishing boats and local children played football. The islands really are places to come for a longer stay, to sightsee and unwind in lovely, unusual surroundings. The hardest thing is leaving. 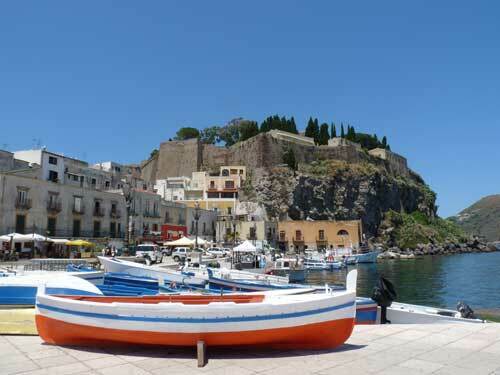 The most practical base is the island of Lipari. This is the largest island with the most to offer - a pretty, reasonable-sized town with a choice of accommodation and the busiest port for hydrofoil and ferry connections. You can make daytrips to the other islands from here. Panarea is the most chic island, small and exclusive with prices to match. Stromboli is for thrill-seekers wanting to climb the volcano, though apart from the hike and a boat trip to see eruptions there isn't really that much to do. Vulcano has famous sulphurous-smelling mud baths, a gently fuming volcano and beaches. Salina is green and natural and a good destination for a quieter stay. 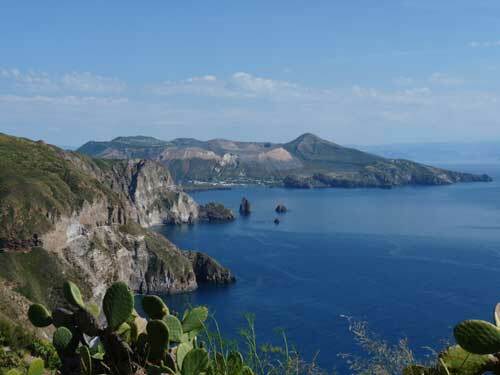 Alicudi and Filicudi are the most remote; two extinct volcanoes emerging from the sea and feeling like the end of the world; transport on Alicudi is by donkey. In order to explore each of the islands thoroughly, you would really need to base yourself overnight on each. Ferry timetables and tourist excursions can leave you feeling rushed on day trips. Obviously, though, this wouldn't make for a very relaxing holiday, so most tourists prefer to choose one island base and pay short visits to the others. 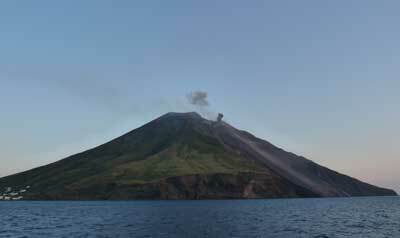 You can't visit the Aeolian Islands without paying a trip to see the eruptions on Stromboli. If you don't fancy hiking up the volcano, you can catch an evening boat trip (setting off in the afternoon from other islands) to watch the volcano's fiery eruptions from the waters close to the Sciara del fuoco, a lava-scarred slope. Boat trips are the principal tourist activity on the islands and in the tourist season you'll be approached every five minutes by friendly touts and agencies offering tours. A cruise will typically tour the rocky coastline, point out interesting sights, drop you off for a wander around little island villages, give travellers a chance to swim from the boat and perhaps, if you're lucky, see dolphins. For those who enjoy island-hopping, the islands are connected by regular ferry services, although these are less scenic than the tourist cruises. Each of the islands has at least one picturesque village to explore, with plenty of photo-opportunities. The larger of the islands have local bus services to help you get around. As well as hidden bays and rocky shores, the islands have a few beaches, generally volcanic sand or pebbles. Among the stones on the beaches, you may find pieces of shiny obsidian, a black volcanic glass-like rock which was used to fashion knives and tools in prehistory, and pumice stone - which floats on water and has a variety of uses including as an exfoliant. The presence of obsidian put the Aeolian Islands on early trading routes and several Bronze Age settlements have been discovered. The best discoveries from the islands, and from local shipwrecks, are displayed in an excellent archaeological museum in Lipari's old walled citadel - another 'must' for visitors to the islands. Important exhibits include Greek pottery dating from Lipari's time as a Greek colony, and a collection of miniature theatrical masks found in local burials. Although recreational walking is not particularly publicised locally, the landscape, sea views and old mule tracks make the islands appealing to walkers. 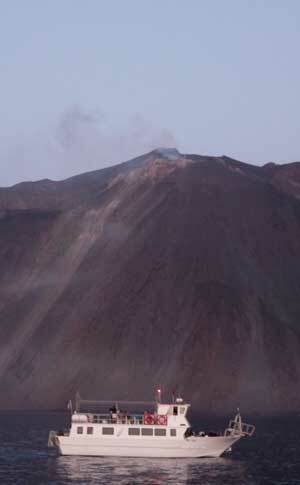 On Vulcano and Stromboli you can follow popular routes to the top of the volcanoes' craters - on Stromboli you are required to hire a guide - which allow you to see lava eruptions on Stromboli and gas emissions on Vulcano. These are demanding walks, and much of the hiking on the islands requires some determination since the islands originated as steep-sloped volcanoes. But although there aren't huge numbers of well-marked footpaths, you will find a variety of walks including less challenging strolls and rambles among flowers, butterflies and traces of the islands' past. 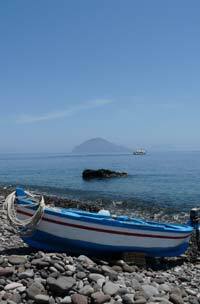 Travel to the Aeolian Islands involves a multi-stage journey, which can be time-consuming and dependent on sea conditions. For this reason I recommend the islands for a longer stay rather than a weekend break, and would advise allowing plenty of time for the journey to and from the airport. The islands are served by ferries and hydrofoils from a number of Italy's ports. There is no airport, but if you are feeling wealthy you can arrive by helicopter (see our links panel). The main port of departure for the Aeolian Islands is Milazzo, situated on the northern shore of Sicily. There are frequent fast ferry services from Milazzo, and this is the most convenient and reliable port to aim for. However, there are also services (more frequent in summer) from Palermo and Messina in Sicily and from Reggio di Calabria in mainland Italy. During the summer tourist season, there are also occasional ferries from other local ports - these are often designed as day trips to the islands, but may be a feasible option for travellers wanting to stay longer. The nearest airports are Catania (BA flights from the UK), Palermo (Ryanair and Easyjet from London), Reggio Calabria and Lamezia Terme (Ryanair from London). The most straightforward way to reach the islands from the UK is to fly to Catania Airport, then take a direct bus link or private transfer to Milazzo port, where you can catch a ferry to Lipari and the other islands. The direct bus is run by Giuntabus and leaves from outside the airport. It's a fast and efficient service, but unfortunately it is seasonal with varying frequencies. Competitors sometimes operate on a less formal basis; you could try contacting your hotel to see if they can book an alternative for you. If the bus transfer times aren't convenient for your flight, the alternative is stay overnight in Catania, or to catch a bus from Catania Airport to Messina run by SAIS, which takes under two hours. This stops at Messina railway station, right next to a bus stop for a Giuntabus service to Milazzo port, which takes 50 minutes. In Milazzo the buses stop on the road right by the port. Ferry offices selling tickets are on one side of the road; the jetty for catching fast boat services is the other side of the street. It is also possible to catch a train from Catania to Milazzo taking approximately 2-3 hours and changing in Messina. The drawback of rail travel is that you will need to use connecting buses or taxis to reach the airport in Catania, and the port in Milazzo. The two principal ferry companies providing ferry services to the islands are Siremar and Liberty Lines (previously Ustica Lines). These companies' websites, where you can find the latest timetables and prices, are listed in our links panel on the right. Most of the connections are by fast hydrofoils and catamarans but larger, slower ferries also ply the routes, and these carry cars as well as passengers. There are restrictions on bringing vehicles to the islands, and tourists will generally find it more convenient to leave cars behind on the mainland. An alternative route to the island is to travel by ferry or hydrofoil from Naples (served by flights from the UK). There is an overnight ferry between Naples and the Aeolian Islands, typically twice a week though varying with the season, operated by Siremar. At the time of writing, Siremar ferries leave Naples on Tuesday and Friday departing at 8pm and arriving in the morning. They return on Monday and Thursday. Prices are approximately €50 one way per person or more for cabins. There is also a faster hydrofoil service from Naples between mid-June and September, operated by Alilauro, which takes around six hours and costs from €160 return. 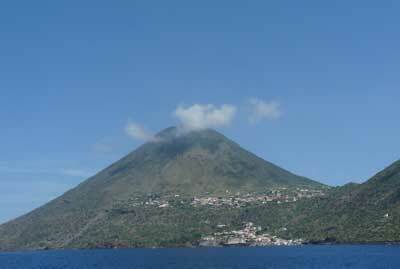 To reach the Aeolian Islands without flying, you could travel to Naples by train and then catch a ferry to the islands. This journey could be accomplished in a couple of days by taking an afternoon service from London to Paris, changing trains and stations for an overnight service to Rome, arriving in the morning and changing to a train to Naples. Although there are various options for reaching the Aeolian Islands, and your choice may be determined by your starting location or flight availability, I'd recommend the Catania Airport-Milazzo route - described above - as being the most straightforward. Milazzo is the best port to aim for. When there are rough seas around Italy - which is fairly common in winter and not impossible even in the summer - connections to the islands can be cut, and the Milazzo services are the most frequent and the most likely to run at least a minimal service. Palermo airport is a good second choice as you may find bargain flights and be able to catch a hydrofoil from the town to Lipari - or failing that, take a 3-hour train ride to Milazzo. In just about every island you'll find your ferry is met by smiling faces offering rooms to rent - or if not, you will easily find a local who'll suggest a relative with a room for you. If you are brave, this can work out well, but at peak season, or if you want to be sure of your accommodation in advance, you can easily book a hotel or B&B online. In Lipari I stayed in a lovely 'residence' (huge rooms, kitchenettes) on the pretty main street, the Residence Alberghiero Eolie, and also in a decent cheap option, the Hotel Oriente. Some hotels close in the winter months, but if you arrive in spring, early summer or autumn you could find some competitive rates.